书籍简介: Imagine a secular corporation in which profit has spiritual overtones... where the corporate motto is \\\\\\\\\\\\\\\\\\\\\\\\\\\\\\\\\\\\\\\\\\\\\\\\\\\\\\\\\\\\\\\\\\\\\\\\\\\\\\\\\\\\\\\\"Respect the Divine and Love People,\\\\\\\\\\\\\\\\\\\\\\\\\\\\\\\\\\\\\\\\\\\\\\\\\\\\\\\\\\\\\\\\\\\\\\\\\\\\\\\\\\\\\\\\" and where passion and vision have supplanted the long-term business plan... most tellingly, a corporation in which employees have a unique slogan: \\\\\\\\\\\\\\\\\\\\\\\\\\\\\\\\\\\\\\\\\\\\\\\\\\\\\\\\\\\\\\\\\\\\\\\\\\\\\\\\\\\\\\\\"What we like to do next is what people tell us we can never do.\\\\\\\\\\\\\\\\\\\\\\\\\\\\\\\\\\\\\\\\\\\\\\\\\\\\\\\\\\\\\\\\\\\\\\\\\\\\\\\\\\\\\\\\" These are te tenets of a real company led by one of Japan's most dynamic and charismatic entrepreneurs. The principles under which it runs may be counter to everything you have ever learned about management. These principles are precisely what this book is about. \\\\\\\\\\\\\\\\\\\\\\\\\\\\\\\\\\\\\\\\\\\\\\\\\\\\\\\\\\\\\\\\\\\\\\\\\\\\\\\\\\\\\\\\"If your motivation and your methods are virtuous,\\\\\\\\\\\\\\\\\\\\\\\\\\\\\\\\\\\\\\\\\\\\\\\\\\\\\\\\\\\\\\\\\\\\\\\\\\\\\\\\\\\\\\\\" Kazuo Inamori writes, \\\\\\\\\\\\\\\\\\\\\\\\\\\\\\\\\\\\\\\\\\\\\\\\\\\\\\\\\\\\\\\\\\\\\\\\\\\\\\\\\\\\\\\\"you need not worry much about the result.\\\\\\\\\\\\\\\\\\\\\\\\\\\\\\\\\\\\\\\\\\\\\\\\\\\\\\\\\\\\\\\\\\\\\\\\\\\\\\\\\\\\\\\\" To the amazement of cynics, his unusual insistence on not pursuing profit but \\\\\\\\\\\\\\\\\\\\\\\\\\\\\\\\\\\\\\\\\\\\\\\\\\\\\\\\\\\\\\\\\\\\\\\\\\\\\\\\\\\\\\\\"letting it follow our actions\\\\\\\\\\\\\\\\\\\\\\\\\\\\\\\\\\\\\\\\\\\\\\\\\\\\\\\\\\\\\\\\\\\\\\\\\\\\\\\\\\\\\\\\" has made the companies he founded among the most profitable enterprises in the world. 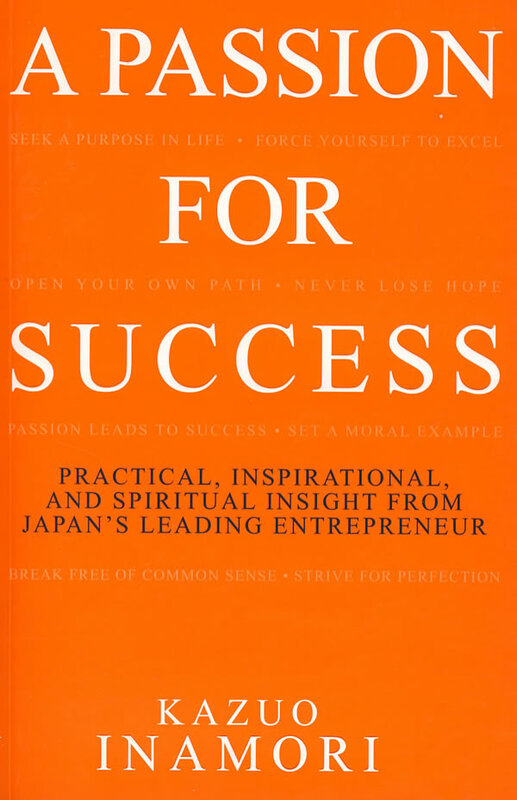 A Passion for Success presents Inamori's personal business philosophies as they illuminate universal struggles of the human spirits within competitive markets. Young or old -- successful or striving -- you are sure to find it original, compelling, and deeply inspirational. Features of this book -- The author's insight on how to succeed in business and how to succeed in life presented in short, one-page vignettes. -- Extracts of interviews with the author.